Thursday: Garlic Lemon Double Stuffed Chicken ---repeat of last week it was soooo good! p.s. 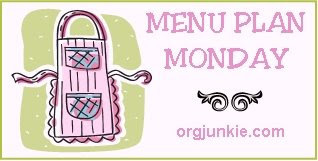 : Check out more menu plans at Org Junkie's Menu Plan Monday! Good post!! Love the crockpot swiss stuffing chicken, it is one of our favs. I think the Garlic-Lemon Double Stuffed Chicken sounds wonderful!! I will have to try that in the upcoming weeks. I like how you linked to your previous Menu Plans, too! I need to learn how to do that! I will be back next week to see what you are serving! Sounds like a yummy week you've planned; especially the garlic lemon double stuffed chicken! Sounds delcious! I'm going to have to give your chicken pot pies a try.. those look yummy and i love cooking this in my muffin pans! Your recipe for the Crockpot Swiss Chicken is alot like mine. It's one of my family's favorite and it's so easy to make. I even make mine in the oven sometimes. The garlic lemon chicken sounds so yummy. I've never tried that and will have to get it on our menu. Thanks for sharing. Its chicken week over at Lindsays! Hahahaha my poor husband - it's always chicken week!!! !